At the moment I can't access SE at school because all three of the services above are blocked (except Stackexchange). How do I use Stackexchange to log in? I've tried entering 'Alyosha' and '[password]', but that doesn't seem to work. Am I, as a user, automatically registered for this login process, or do I have to activate something at the main Stackexchange site? Create a StackExchange OpenID account. You don't have to reuse an existing password here. In fact, it's better to use a new one. Go to Math.SE. Log in via Gmail (or your preferred method) if you aren't already. 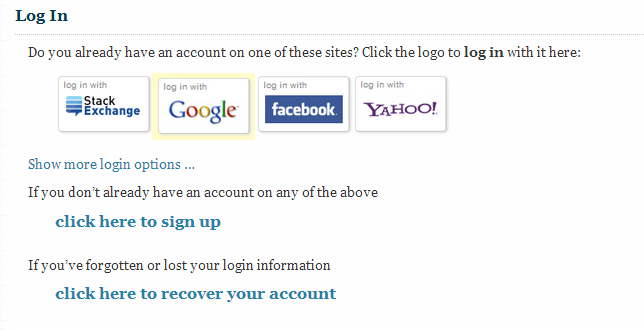 Go to your user page and click 'my logins'. Click 'Add login' and log in to your new StackExchange OpenID account. Once done, you should be able to log in via StackExchange using the Internet connection at school.